Managing Wine Quality reviews global developments of importance to wine producers, researchers and students. Volume I: Viticulture and Wine Quality reviews our current understanding of wine aroma, color, taste, mouthfeel, and the measurement of grape and wine properties. Topics covered include the instrumental analysis of grapes, sensory evaluation, and wine authenticity and traceability. The effects of viticulture technologies on grape composition and wine quality attributes are also explored, with terroir, viticultural and vineyard management practices, fungal contaminants and grape processing equipment discussed. 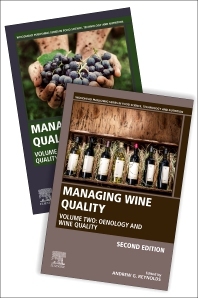 Volume II: Oenology and Wine Quality explores how wines are influenced by many aspects of both grape production and winemaking. Prof. Reynolds has had a long and distinguished career in Oenology. His career has included a position as Research Scientist for Agriculture Canada in British Columbia and, since 1997, a faculty position at Brock University. He is well known for his research into canopy management, the impacts of site and soil on flavour, irrigation and water relations, geomatics and the use of GPS/GIS and remote sensing for studying terroir. He is the author of over a hundred published articles and has been the editor of two award-winning titles on wine science.